An NCEA Level 1 Certificate is awarded to a student who gains at least 80 credits from any level of which 10 must be in Literacy and 10 in Numeracy. Specified Standards available through a range of subjects are identified with (L) for Literacy and (N) for Numeracy in the Subject Information below. Students must take whole courses. More than one assessment opportunity is available for some internally assessed Standards during the year. 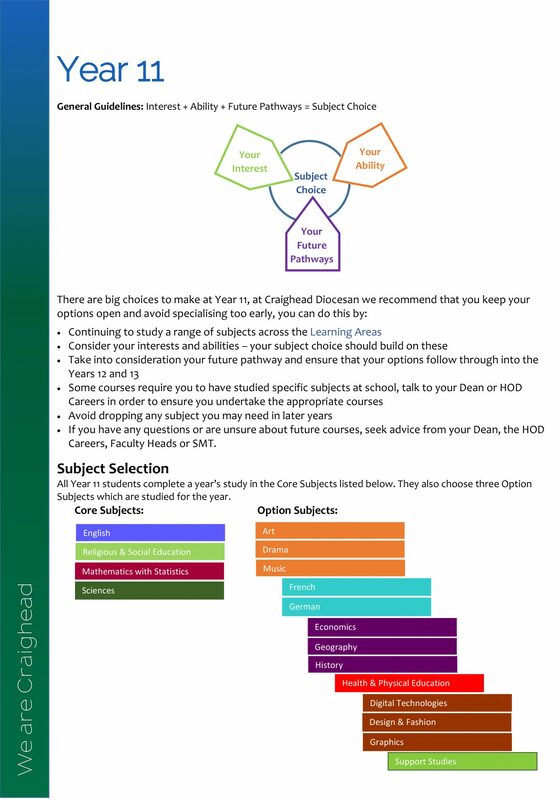 A booklet detailing the School’s NCEA Assessment policy will be provided to students and parents at the beginning of the year. Reporting of results will be on progress towards a NCEA Level 1 Certificate. Students will gain an award of Achieved, Achieved with Merit or Achieved with Excellence for each Standard or Achievement for Unit Standards. The National Certificate of Education Achievement (NCEA) is the main qualification for secondary school students in Aotearoa, New Zealand. NCEA is recognised by employers, and used for selection by universities and polytechnics, both in New Zealand and overseas. 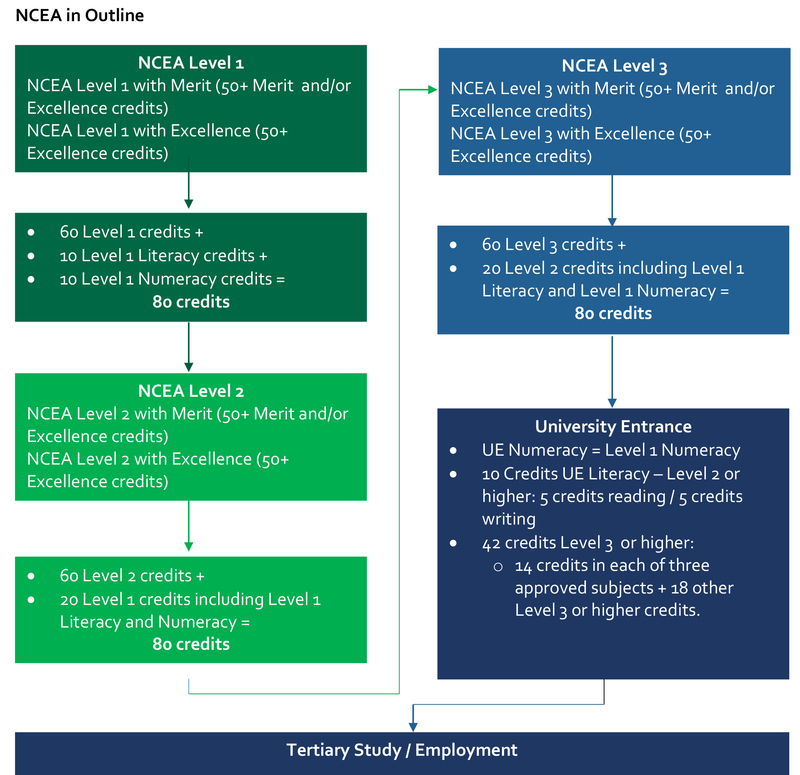 There are three levels of NCEA Certificate, depending on the difficulty of the standards being achieved. Student generally work through Level 1-3 in Years 11 – 13. These levels reflect the National Qualifications Framework Levels 6-8. NCEA is a national qualification on the New Qualifications Framework. Standards that secondary students achieve as part of the NCEA can be used as building blocks for other qualifications. It challenges student of all abilities across all levels in all Learning Areas, and shows credits and grades for separate skills and knowledge. Each year students study a number of courses or subjects. Each subject is assessed against a set of Achievement Standards, some of these are internally assessed and some externally assessed. When a student achieves a standard they gain the credits linked with that standard. Students must gain a specified number of credits in order to gain their NCEA certificate. In achievement standards, students can gain one of four grades – Not Achieved, Achieved, Achievement with Merit, Achievement with Excellence. Each achievement standard describes what student have to do to reached Achieved, Merit or Excellence. The standard, or the level of work required, is demonstrated in exemplars provided by NZQA. Merit and Excellence grades require a significant step up from what is needed at Achievement Level. Only those students who meet the criteria for Merit and Excellence Level get those grades. The proportions of those gaining Merit and Excellence change little from year to year. Generally around 25% of students achieve Merit grades and approximately 14% attain Excellence grades. To attain Level 1 students need to gain 80 credits. Included in these 80 credits, students need to gain 10 Literacy credits and 10 Numeracy credits. There are a wide range of achievement standards that have been identified as eligible to meet literacy and numeracy requirements at Level 6 of the Curriculum. To attain Level 2 students need to gain 60 Level 2 credits, 20 of these can come from Level 1 or 3 standards. The literacy and numeracy requirements must also be met for students to achieve Level 1. To attain Level 3 students need to gain 60 Level 3 credits, 20 of these can come from Level 3 standards. Credits gained at one level can be used for (or count towards) more than one certificate. Credits can be accumulated over more than one year.